Customers can enjoy summers outdoors with the St Mawes Drinks/Planter Bar Table. Leading on from the success of our original shorter size, this new 180cm table can seat a maximum of eight people comfortably. Crafted in Reclaimed Teak, each piece of wood is kiln dried, waxed, polished and bottle rubbed to allow the wood grains, marking and textures to shine through. Named after a coastal town in Cornwall, our St Mawes range provides you with organic charm that fits perfectly in any garden, terrace or poolside for outdoor entertainment. The contemporary design comes complete with an inner galvanised steel drinks trough that sits down the centre of the table. 80cm in width, it can be filled to the brim with ice, keeping wine and prosecco perfectly chilled at parties. 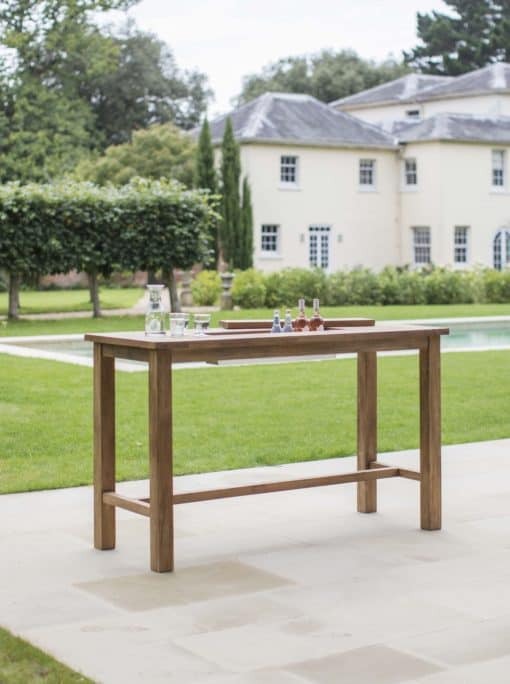 This versatile bar table is also a wonderful choice for bars, hotels and restaurants to create a striking cocktail or alfresco dining experience for customers. This St Mawes Drinks/Planter Bar Table could even be planted up with herbs and flowers to create a beautiful eye-catching display. 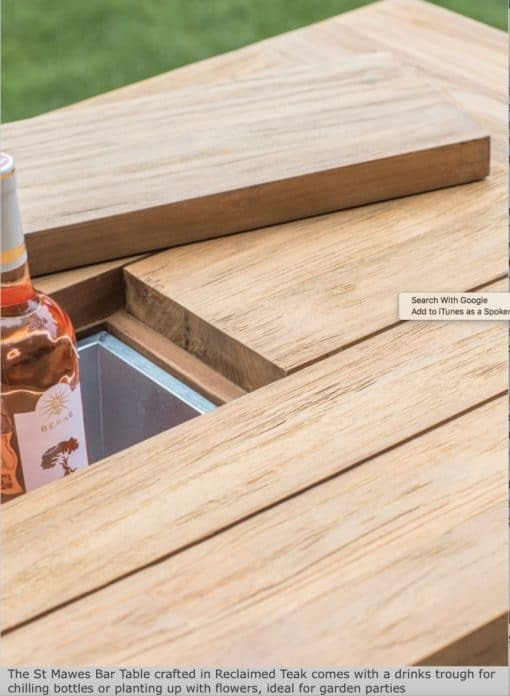 If customers don’t require use of the ice trough, the table comes with a solid teak slat to cover the top. Sturdy, strong and long lasting, the rustic honey brown colouring will age once placed in the garden to a soft grey finish. Why not match with our selection of outdoor bar stools to create the perfect set? With all outdoor furniture, we advise storing under cover during the winter months.